But wait a minute, I thought we were told Obamacare was going to destroy free-market insurance companies? I mean isn't "rampant socialism" supposed to be bad for capitalism? Of course the ACA is nothing close to the socialist program Republicans would have us believe -- just ask Mitt. But all you really need to do is check out the performance of the health care insurance stocks. If Obamacare was going to wreak havoc on the private insurance industry, one would surely see the proof in the pudding when it came to stock price returns. 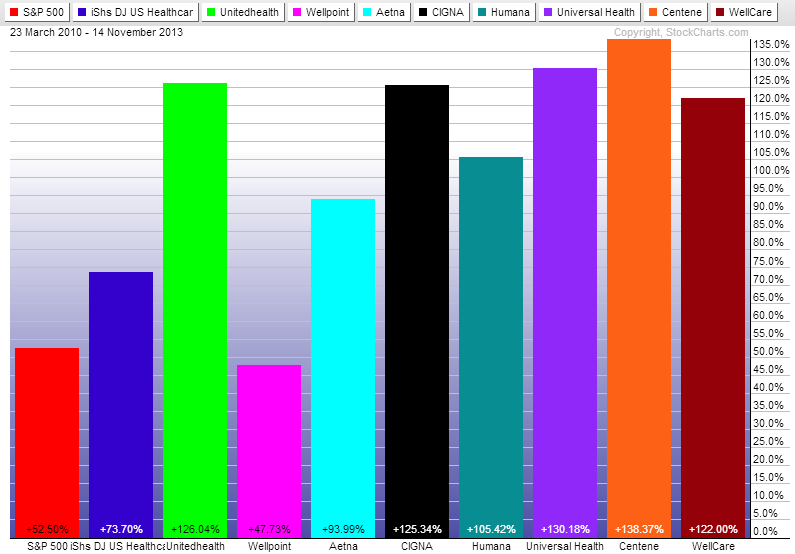 The chart below shows stock price performance for the S&P 500 (red), the iShares US Health Care Provider ETF (IHF, blue) and then eight of the largest publicly-traded health care insurers. The start date is March 23, 2010, when President Obama signed the ACA into law. In the time period, the health care provider ETF returned 74%, far surpassing the 52% gain for the S&P 500. Meanwhile seven of the eight insurance stocks easily trounced the S&P 500 with only Wellpoint underperforming the S&P 500, albeit ever so slightly. Oh yeah, it's quite clear Obamacare has just devastated our capitalist system.... Gads, just more lies.